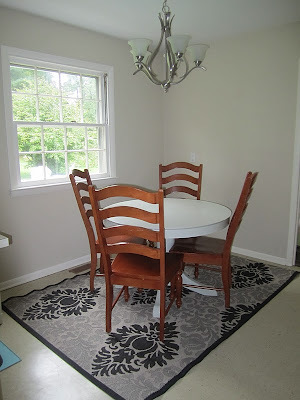 On Monday, I posted about my beloved Zig Zag Rug that I thought was going to be perfect for the kitchen breakfast nook. Sadly, it was not. The rug, while so so chic and soft, is a woven cotton and just not ideally suited for under a kitchen table where two children eat. So out it came. I took note of what worked and what didn't with the rug. I liked that it had a cool pattern: I wanted something a little modern and fun, but nothing too crazy. I liked that it had a natural texture and felt good under foot. The size (5x7) was just about right. On the other hand, I did not like that it wasn't stiff enough: I needed something that would stay in place when the chairs moved in and out. I did not like that you could not clean it easily: not with a vacuum and not with a broom. I did not like that it did not repel stains (water, food, etc.) very well. 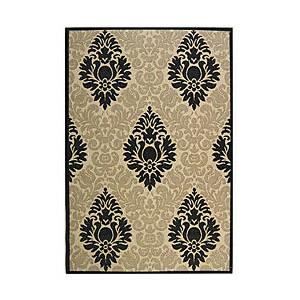 I went trolling for rugs online and went to one of my favorite spots: Overstock. I have only had great experiences at Overstock, and you cannot beat the $2.95 shipping plus super quick delivery. I narrowed the search results to the least expensive 5x8 sized rugs and came across a really cool indoor-outdoor jute looking number: the St. Bart's Indoor Outdoor Sand rug. What caught my eye (besides the great price) was the oversized pattern, which reminds me a lot of the print on my drapes in the den. The price was right, so I clicked the order button and crossed my fingers and toes. Unbelievably, the rug arrived just two days later and yippie! 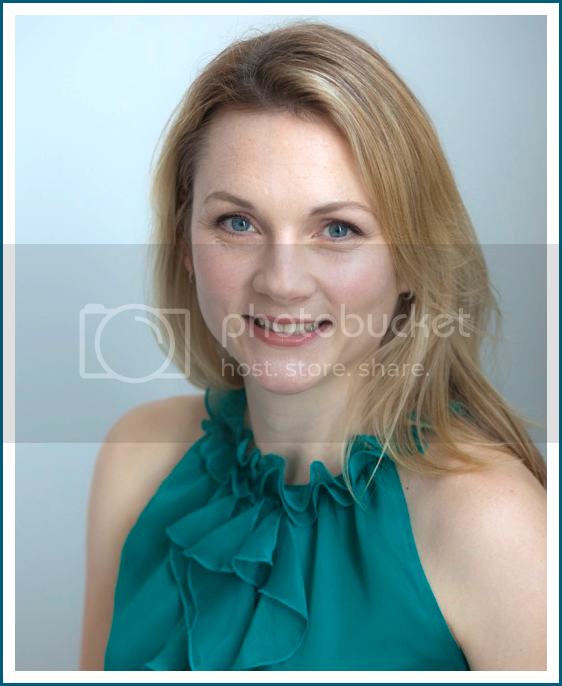 Look at how lovely! It's more grey than "sand" as the description says, which is a huge bonus to me because of all the grey in my space. I love the oversized print and the grey has a great texture, which is comfy (though admittedly not as cushy as the cotton zig zag rug) and will hide stains well. Here is how this space has evolved ... from no rug to the zig zag rug to the current rug. I'm happy with how it looks now! You know those brown chairs are taunting me with their ugliness. I need some quality time with them and a paint brush (or spray paint ... still on the fence). 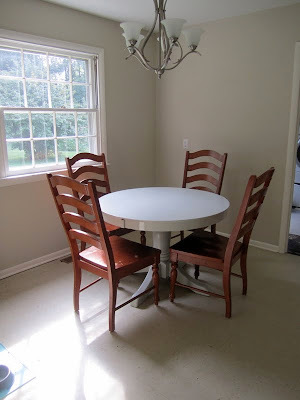 Hopefully in the coming weeks I can turn to this project and make the brown chairs white! One quick question for you guys: what would you do for a window treatment in this space? Right now I have nada on the windows and it feels a little too stark. See? Would you do a bamboo shade? A drape shade in a cool fabric? Something completely different? I'm all ears. Wow! What a nice rug! Love it and you can't beat that price (yes I clicked over to o.co to check it out)! I think a pop of color on the windows would be nice. What about some layering like... some sheers with a valence in a fun fabric or a valence with some bamboo shades? 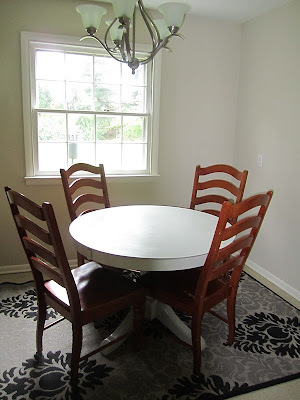 i'm all about the valence in the dining area... that way no one can drop food on your pretty drapes. I love this one Shanna, the large print makes a huge statement!!! When you paint those chairs, it will stand out even more!! I love the idea of a bamboo shade, which will add some warmth since you plan to paint the chairs!! You have a great eye! !